Carnations are a timeless and inexpensive way to dress up your home with fresh flowers. 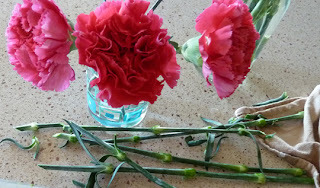 A small bouquet of carnations can make a large impact when the stems are trimmed and arranged in a short vase. In my case, the perfectly-sized vase was a simple drinking glass with a turquoise design I had painted on it years ago. But, I didn't want the busy pattern to diminish the impact. A little red shimmery tissue paper, a burgundy satin ribbon and a big silver button are ready for a "cover-up." Wrap the tissue around and secure with double sided tape in the back. Tie the satin ribbon around next after stringing it through the decorative button. Extras from my craft supplies – I used simple things everyone has laying around. And now I have a bright, stylish bouquet, packing quite a punch for little money and time. 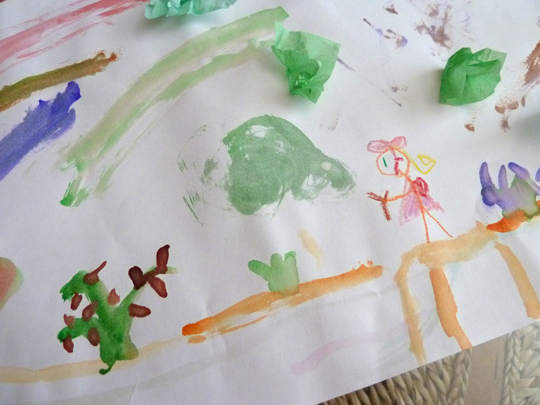 My daughter on the bridge, surrounded by cactus and desert flowers and plants. What an easy and clever idea! I just stopped by from SITS to say hi; hope you find time to do the same. And it looks like your daughter is following in her mom's footsteps! 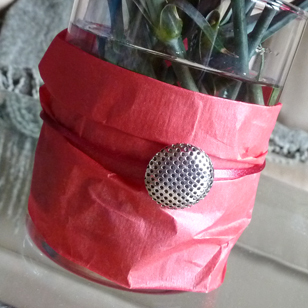 I've used tissue paper to cover vases too! 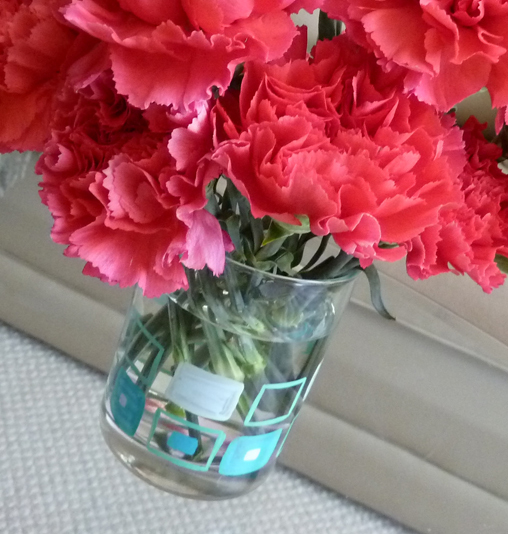 It's an easy and inexpensive way to have a matching vase! 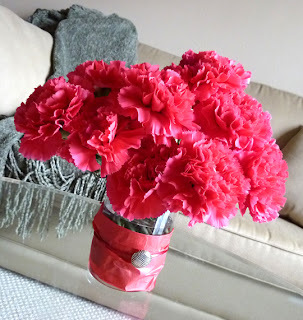 Such a cute and inexpensive way to decorate a vase--I love it! Great idea. I love it. Its an excellent and easy way to bring freshness in your home. Thanks for lovely sharing.